ROME (CNS) — The Eucharist is a tangible reminder of God’s love, and receiving Communion is a call to work to build the body of Christ by loving others and shunning all that sows division within a community, Pope Francis said. Pope Francis celebrated the Mass outside the Basilica of St. John Lateran, the cathedral of the Diocese of Rome. With an almost constant breeze cooling the warm Rome day, thousands of people — including children who made their first Communion this spring — gathered outside the basilica for the evening Mass and for the Corpus Christi procession later from St. John Lateran to the Basilica of St. Mary Major, about a mile away. The 2017 feast day included two major changes from past practices. First, although Italian dioceses, like many around the world, moved the feast from a Thursday to a Sunday in the late 1970s, the Mass and procession with the pope at St. John Lateran remained on the Thursday until this year. Second, instead of transporting the Blessed Sacrament on a truck in the Corpus Christi procession this year, it was carried on a platform held aloft on the shoulders of four men. Eight other men carried tall poles holding a canopy over the platform, a task made more difficult by the breeze. The truck had made its first appearance in 1994 when St. John Paul II began having difficulty walking. He and now-retired Pope Benedict XVI would ride on the truck, kneeling or sitting before the monstrance. Elected at the age of 76, Pope Francis walked behind the truck for the 1-mile procession in 2013. But beginning in 2014, because of his difficulty walking long distances and in order to avoid drawing attention away from the Eucharist, he met the procession at St. Mary Major instead of participating in it. “Remembrance is essential for faith, as water is for a plant,” Pope Francis said. Pope Francis said it seems that today people’s ability to remember and be mindful is weakening. 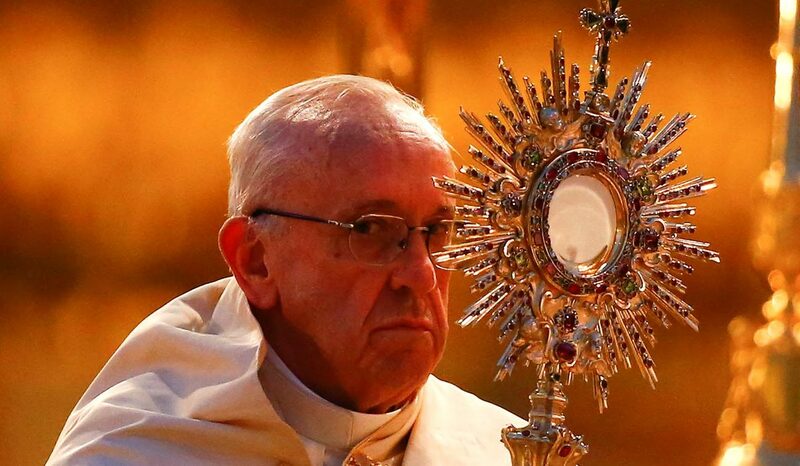 The feast of the Body and Blood of Christ, the pope said, reaches people even in their “fragmented lives,” reminding them how Christ was broken for their salvation and continues to offer himself in the “loving fragility” of the Eucharist. “In the Bread of Life, the Lord comes to us, making himself a humble meal that lovingly heals our memory, wounded by life’s frantic pace of life,” he said. At the same time, the pope said, the Eucharist is a reminder that Christians are not isolated individuals but are called to receive Christ’s body together and to build up the body of the church.